Johnson&Johnson 1-Day ACUVUE® Moist (30 Pack) - A single use, daily disposable lens which is great for people with a busy lifestyle. 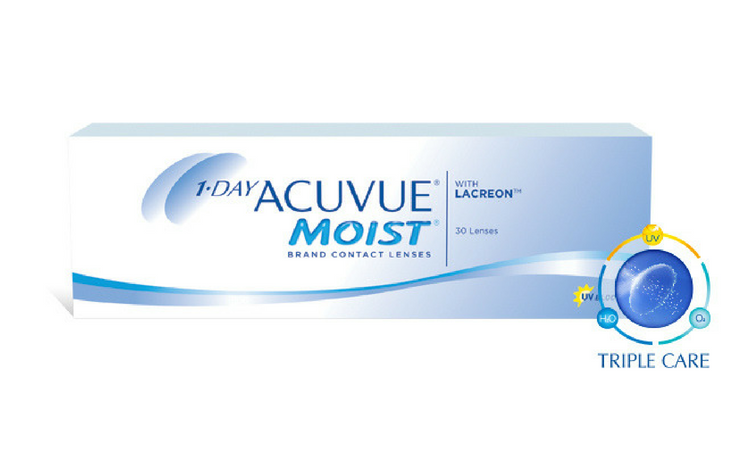 Johnson&Johnson's 1-DAY ACUVUE® MOIST® contact lenses will give you exceptional comfort from the moment you put them in, to the moment you take them out at the end of the day. That's because they’re the only daily disposable contact lenses with Johnson&Johnson's exclusive LACREON® Technology. LACREON® is a proprietary technology that permanently embeds a water holding ingredient, similar to that found in natural tears into the contact lens material, etafilcon A. For allergy sufferers, clinical research has shown that a fresh pair of contact lenses every day (made from etafilcon A) may provide improved comfort for people suffering from mild discomfort and/or itching associated with allergies while wearing contacts, compared to lenses replaced at intervals of greater than two weeks.